Welcome to Coleraine Design! We are a small web development and consulting firm just outside Philadelphia. We make building an online presence easy for our clients. The Vereinigung Erzgebirge is a social and sports club with premier catering facilities located in beautiful Warminster Township in Bucks County, Pennsylvania. The club was founded by immigrants from the Erzgebirge region of eastern Germany in 1931 and is now home to many of their descendants. Our 68 acre grounds are home to our beautiful clubhouse, Ratskeller bar, outdoor patio, canteen, picnic grove, Olympic-sized swimming pool, soccer fields and other amenities for our members and their guests. There is something for everyone at the VE Club! Click Here to visit! We worked with the Upper Moreland Soccer Club to create a professional looking website for their soccer club. We produced a WordPress website that would set their club apart from the rest of the soccer clubs on the east coast of the USA. Coleraine is also a proud sponsor of UMSC’s soccer program. Visit UMSC to learn more about their soccer programs. No Irish Need Apply consists of five musicians from the Philadelphia, Pennsylvania who sing original and cover songs showcasing the austere lifestyle of the Irish people as they immigrated to America in search of a better life. The musicians proudly highlight the Irish-American work ethic and love of family through a harmonic mix of gospel, rock, folk and blues songs. 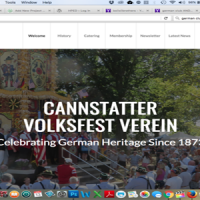 One of the oldest and largest of the German-American clubs in Philadelphia, the Cannstatter Volksfest-Verein was founded in 1873 for the purpose of celebrating the customs and traditions of their homeland, especially the annual harvest festival held in the town of Bad Cannstatt. Click Here to view the site! We designed a WordPress website for County Tyrone, Ireland native Raymond Coleman. Raymond wanted a modern website that would highlight his music and upcoming gigs. Stop by raymondcoleman.com and listen to some of the best Irish music this side of the Atlantic. We were approached by Bryan Taylor of The Palace in Downingtown, Pennsylvania to create a brand new web presence for their popular bowling and entertainment center. We worked with the Bryan to produce a WordPress powered website to highlight his bowling center’s wide variety of entertainment options. Visit the Palace today! The Oakmont National Pub is an award winning pub and restaurant located in Havertown, Pennsylvania. They required a newly designed website to showcase and highlight their wonderful food, craft beers and weekly live entertainment. The site was built on WordPress to allow the Oakmont National Pub staff to easily manage and update their always changing website. Bryan Taylor of The Flower Station asked us to redesign his website into something that was easy to navigate and had a fresh, modern feel. We worked with Bryan to build him a WordPress powered website that would highlight the lovely flowers, shrubs, and other landscaping services that his company provides. Visit the Flower Station today! Coleraine Design, based just outside of Philadelphia, Pennsylvania, is a small web design and consulting firm founded in 2007 by Séamus Cummins and Brendan Goggin. The two met while attending graduate school at Saint Joseph’s University. They enjoy over 22 years of combined experience in technology leadership, instructional design consulting and web development. Our aim is to provide an excellent, friendly and professional service for all of our clients. We are passionate about designing and producing amazing looking websites that exceed our client’s every expectation. Wordpress – Whether you are looking for a simple blog or a beautiful WordPress powered website, we have you covered. If you are just looking for some assistance with installing, testing and configuring your WordPress site, we can help you with that as well. Content Managed Websites – It is critical that you keep you website’s content fresh and up-to-date. We can help design a content managed website that will allow you to instantly update the content of your website without having to have a designer on contract to do it for you. Social Media – Using social media is critical to having a successful brand. Using these tools provide you with low cost marketing, customer feedback and interactivity, and will help you to build trust among your followers. We’ll help you to select the perfect social media strategy to build your brand. Website Hosting – There is no need to have to go out and find a hosting service for your website. We leverage the power of Media Temple to host almost all of our client’s websites. Your hosting package is then managed by our team and you call us directly should you ever have an issue. Technology Consulting – If you are starting a new business or are looking to upgrade your existing technology infrastructure, we can help you put a plan in place to help your business grow. We have a full suite of technology services to meet your every need. Séamus is our creative director, project manager and lead technology consultant. Since Coleraine was founded in 2007, he has assumed every role from technology planner to bookkeeper. He still wears multiple hats, but spends the majority of his time producing innovative web sites for our clients. In his spare time, Séamus enjoys spending time with his wife and three boys, running and supporting Celtic Football Club. Brendan is our Instructional designer, social media director, marketing strategist and multimedia specialist. Brendan’s background is unique to small business. Brendan possesses a great deal of experience with embedding smart design with catered business marketing strategies. Brendan’s Instructional design knowledge caters to clients by identifying the skills, knowledge and aptitude gaps of targeted audiences in order to create learning platforms that are designed to close these gaps. Brendan’s leadership roles have included facilitator, researcher, and innovator in the realm of corporate designed differentiated instruction for employees. In his spare time, he enjoys spending time with his wife and two daughters. He also serves as a volunteer as vice President of HPED.